Donald Trump returns from nine days abroad to a White House in crisis over the expanding investigation into links between Trump’s associates and Russian officials. Trump’s visit to the Middle East and Europe included a summit in Saudi Arabia, a stop in Israel, a meeting with the Pope, and meetings of NATO and G7 leaders. However, it has been overtaken in headlines by the Trump-Russia inquiry reaching his son-in-law and senior advisor Jared Kushner. In the steady feeding of information to leading US media, American officials have revealed that Kushner and former National Security Advisor Michael proposed a secret back channel to Russian officials in early December, more than seven weeks before Trump was inaugurated. The Administration and its allies have responded with their own leaks to the press that the White House is considering a shake-up of senior staff and the creation of a “war room” for the Trump-Russia inquiry. Chief of Staff Reince Priebus and chief strategist Steve Bannon returned from Trump’s overseas trip early to deal with the developing crisis. The White House is. putting out the possibility of campaign-style rallies nationwide so Trump can speak directly to supporters. The nature of press briefings will be changed, possibly with rotating spokespeople — rather than the primacy of White House press secretary Sean Spicer — because Trump’s short attention span prefers a variety of staff. The “war room” could bring in former advisors. Both Corey Lewandowski, fired as campaign manager nearly a year ago, and former deputy campaign manager David Bossie have had several meetings in the White House in recent days. Kellyanne Conway, the White House counselor is speaking with prominent Trump backers inside and outside Washington to ask them to be more involved. White House counsel Donald McGahn is considering expanding his office amid reports that Trump is assembling a legal team for the Trump-Russia investigation. A White House aide said the Administration is considering more modest initiatives in Congress that would stand a better chance of quick passage. Trump has yet to get a major bill adopted since his inauguration. The GOP measures to repeal ObamaCare passed at the third attempt in the House of Representatives, but have little chance in the Senate without major changes. The President’s promise of legislation for tax recoding and for infrastructure has stalled. “Two people close to the war room discussions” summarized the mood with a phrase from The Godfather: “Go to the mattresses”. In a sign of the growing tension, White House counsel McGahn rejected a request by Kushner and his wife, Ivanka Trump, for a statement denying that the lawyer had been contacted by federal officials about Mr. Kushner. McGahn, reportedly become more concerned about in his role after Donald Trump ignored his advice to delay the firing of FBI Director James Comey, said that he was not the person to write such a statement and that doing so would create a precedent requiring a response to each new media report. Kushner’s private lawyer issued a statement instead. We have back-channel communications with any number of countries. So, generally speaking, about back-channel communications, what that allows you to do is to communicate in a discreet manner. It doesn’t predispose you to any kind of content in that conversation. The Senate Intelligence Committee asks the Trump campaign to turn over all e-mails, documents, and phone records from the 2016 election. A letter, signed by GOP committee chairman Richard Burr and ranking Democrat Mark Warner, was sent to Trump’s campaign committee last week. It accompanies subpoenas of the documents of Trump campaign officials like former National Security Advisor Michael Flynn and former campaign manager Paul Manafort. The State Department quietly lifts restrictions on the number of refugees allowed to enter the US. The Department notified refugee groups of the decision Thursday in an e-mail, saying that entries are now “unconstrained by the weekly quotas that were in place”. Agencies assisting refugees said numbers could now double from 830 per week for the first three weeks of May to more than 1,500 a week in June. The restrictions were lifted on the same day that federal appeals court reasserting the block of the Trump Administration’s “Muslim Ban” trying to deny entry to refugees and citizens of six mainly-Muslim countries. World leaders split from Donald Trump over climate change at the G7 summit. In the G7’s official dispatch, which all countries typically sign, the US did not join the climate section. 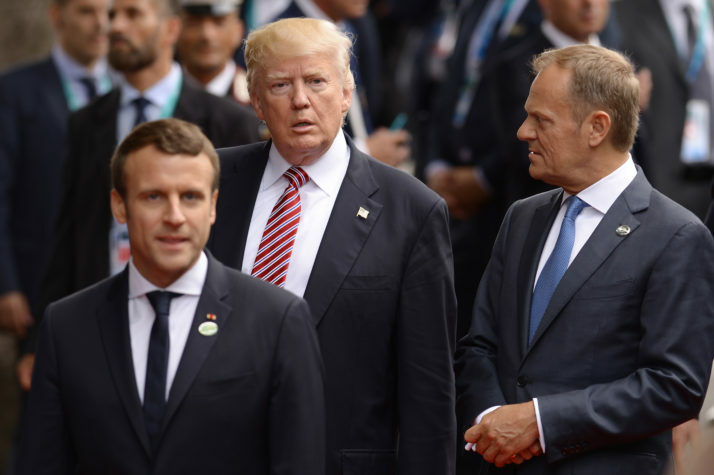 While the leaders of Canada, France, Germany, Italy, Japan, and the UK and the Presidents of the European Council and of the European Commission reaffirmed their commitment to the Paris Accords on carbon dioxide emissions, the US said it “is in the process of reviewing its policies on climate change and on the Paris Agreement and thus is not in a position to join the consensus on these topics”. Trump later tweeted that he will make a decision next week on whether the US will leave the accords, signed by almost 200 nations and including China. The White House has reportedly been split over the issue. Chief strategist Steve Bannon and the head of the Environmental Protection Agency, Scott Pruitt, are pushing for withdrawal. Secretary of State Rex Tillerson, Trump’s son-in-law and senior advisor Jared Kushner, and Trump’s daughter Ivanka are arguing for the US to remain. My hope is that the [US] fully remain in the Paris agreement….Trump is a pragmatic person, I hope he will confirm his commitments, perhaps at his own pace. German Chancellor Angela Merkel signals that European nations should make their own political and military plans without dependence on the US. Merkel continued, “We Europeans must really take our fate into our own hands.” She offered as an example a good relationship with France under its new President, Emmanuel Macron. The audience of about 2,500 people broke out in long applause.